Francis Underwood looms large over the sixth (and final) season premiere of House Of Cards, but he’s nowhere to be seen. You may have heard something about this. Production on this season was abruptly halted a year ago in the wake of sexual assault allegations against star Kevin Spacey, and not long afterward the planned season was scrapped and Spacey was flushed down the memory hole. The series did not have the option of replacing him, as Christopher Plummer did in All The Money In The World (although, sure, that would have been a hoot), but it did have a convenient plot development at the close of its previous season: Claire declaring “My turn” as she succeeded her husband as President of the United States. Frank vowed his revenge as Claire declined to pardon him, but we’ll never know how that version of the sixth season would have played out. Bringing Spacey back would have been a disastrous mistake, but pretending Frank Underwood never existed wouldn’t have worked, either. 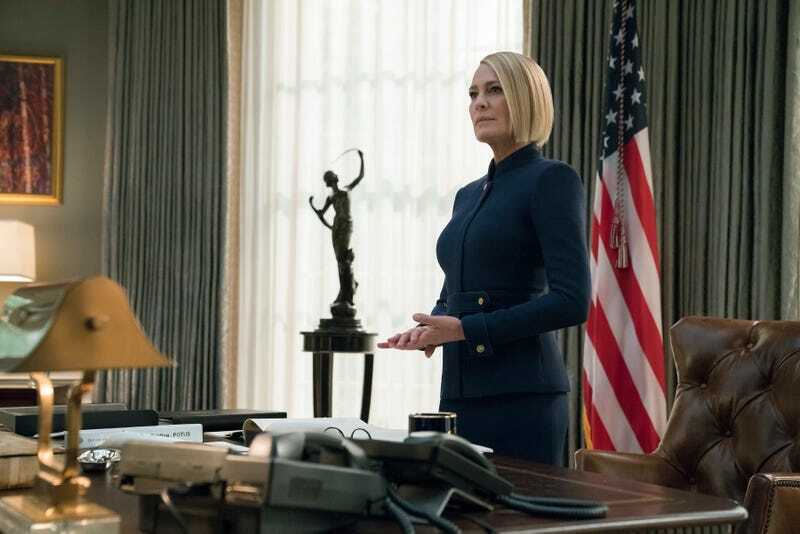 “Chapter 66" plunges us right into the early days of Claire Underwood administration, but although we learn he has died in his sleep, Frank is still haunting the White House—perhaps even literally. Early in the episode, Claire is bothered by a noise that no one has been able to track down; it bears a striking resemblance to Frank’s trademark “knock-knock.” When she finds a bird trapped inside a wall and lets it go, that would appear to solve the mystery, but towards the end of the hour, the sound returns. Frank’s absence also reverberates through the halls of the institution to which Doug Stamper has been confined for psychiatric observation following his confession to the murder of Zoe Barnes—a murder that Frank actually committed. Stamper’s unwavering loyalty, even beyond the grave, dates back to when Frank helped him get sober and gave him his first job in politics. Like Frank before him, Stamper is under the impression that he’s going to be pardoned. What he doesn’t know is that his shrink is reporting back to Claire such critical revelations as the last thing Frank ever gave him (a letter opener from his office) and the fact that he’s not leaving the facility anytime soon. The sudden loss of the previous Oval Office occupant has also affected characters we’ve never met before played by high-profile guest stars. Diane Lane and Greg Kinnear are on board this season as siblings Annette and Bill Shepherd, the House Of Cards version of the Koch brothers. Recall that at the end of last season, Frank told us he was going into the private sector, where the real power is wielded. However this would have played out in a season with Spacey still in the fold, “Chapter 66" drops only a few hints about what transpired between then and now. The Shepherds and Underwoods go way back (at least as far as prep school for Annette and Claire); Frank had gotten involved with them and made some promises before his death—promises that Claire has no intention of keeping. One of these involves a “safety” bill for which the president’s staff is having a hard time coming up with a catchy acronym. It’s been in the works for years, but Claire says she won’t sign it. What’s more, she’s supporting Nancy Gallagher, a military vet and “tax-and-spend Democrat” over the Shepherds’ favored candidate in an upcoming special election. So Frank lingers on, but as “Chapter 66" makes clear from the beginning, this is the Claire Underwood show now. “Are you still there? Do you miss Francis?” she asks us. But everything he told us was a lie, she continues, and the implication is clear: All that came before this wasn’t the real House Of Cards. That begins now. Stealing a page from Boardwalk Empire, we’re treated to flashbacks from our protagonist’s childhood as we catch glimpses of young Claire defiantly smoking a cigarette, getting her clothes shredded by a group of kids, and poking one kid in the eye with a stick. Presumably these will play out over the course of the season with the goal of giving us fuller picture of what Claire is all about. And what is that, exactly? One way of looking at how events unfold in this season premiere is to conclude that Claire isn’t a pure power-monger like Frank—that she actually has ideals she’ll stand up for against the wishes of Those Who Really Run Things. I’m not sure I’m ready to buy into that viewpoint, but it’s clear she’s already the polarizing presence you would expect the first woman president to be, receiving Twitter threats and surviving an assassination attempt on the Fourth of July. “Francis, I’m done with you,” she says as she releases the bird that had been trapped in the White House walls. But it’s not clear that he’s done with her. The exact circumstances of his death are not revealed here, but Claire speculates that he may have been murdered by the people he aligned with. Or perhaps she knows he was murdered; we’ve already seen her poison one man who stood in her way. Whatever the truth turns out to be, House Of Cards has made the best of a no-win situation: Frank is gone but not forgotten. There is one glimpse of Francis Underwood, sort of: In the photos of Claire at his open casket, we see his folded hands, treasured ring in place. That ring later turns up on Frank’s bed, so either she’s losing it a little bit, someone’s messing with her, or we’ve got some kind of Twin Peaks crossover happening here. Another Shepherd is briefly introduced: Annette’s son, who has a plan to “de-charm” Claire. Another new face: Melody Cruz from Beltway Television, who gets on Claire’s bad side immediately by daring to ask a legitimate question while aboard Air Force One. She’s in league with the Shepherds somehow as well.